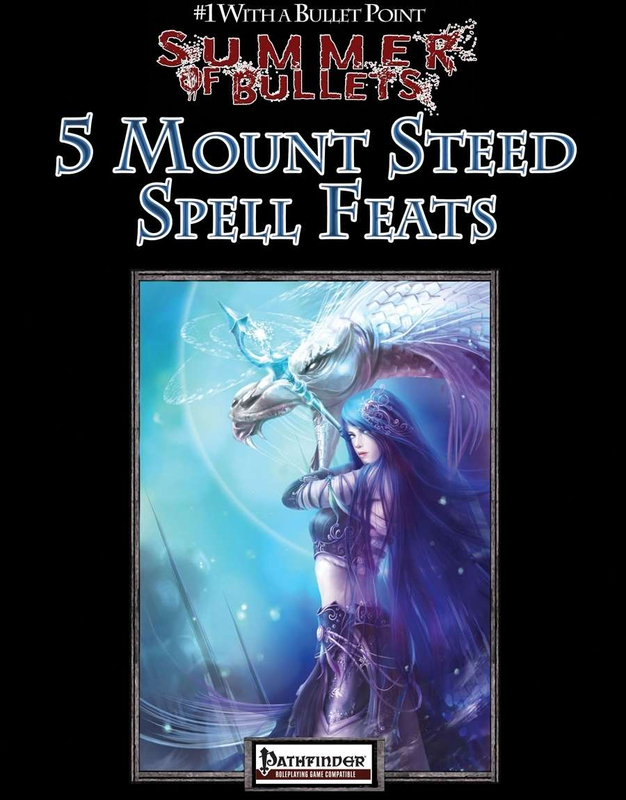 Five feats designed to augment spells used with riders, or improve “steed spells” (spells that conjure a creature or force to act as a mount for one or more characters, such as ghost wolf, mount, phantom chariot, phantom steed, and the communal versions of such spells).This is the latest in a series of products to celebrate the "Summer of Bullets" event! Aethon: When you use spells to protect yourself or allies, you also extend that protection to their steeds. Buraq: When you use spells to heal yourself or allies, you also extend that healing to their steeds. Augment Steed: Your steed spells can boost the effectiveness of mundane steeds. Heighten Steed Spell: You can make your conjured steeds are faster and tougher than most. Summon Steed: You can summon monsters ready to serve as steeds. This title was added to our catalog on September 04, 2012.